What do men really love about women? After 10-plus years of enlightening research with men, I am thrilled to discover that we are most attractive to men by being our natural, feminine selves. 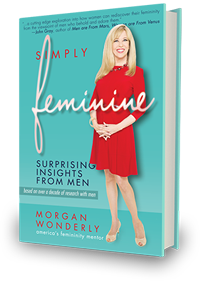 That is so incredibly liberating and fun—that we can be who we really are—I’ve written a book about it, hoping to encourage all women to experience the joy of being Simply Feminine. Your men will love it—if you don’t have one yet it will help you attract one! In her research, she has learned that masculine and feminine polarity is the key to attraction. As women, the more we differentiate ourselves from the masculine by showcasing our femininity, the more we will be attractive to men, as in the yin/yang principle. Ten years of research, hundreds of interviews, and many surprising answers! I have compiled these enlightening insights into a fun and inspiring book, Simply Feminine. It will encourage you to unleash the femininity that all women inherently possess, allowing us to experience the joy of being authentically feminine. You will love it, and so will the men! If you haven’t received your FUN, FREE GIFTS yet, head over here. Also, head over to my Makeover page to see my Simply Feminine Makeovers, including my own! You will simply love being simply feminine!